A very young First Nations rider approaching the finish line signals victory to the cheering capacity crowd. In the last few years Indian Relay Racing has expanded in popularity, and now our country boasts the Canadian Indian Relay Racing Association (CIRRA). These races are not new, and the roots go back over 400 years, making it one of the oldest sports in North America. Horses have always been revered by native cultures, and ownership reflected stature, provided transportation and offered an outlet for competition including relay racing. Now the sport has been modernized. Standardized rules allow for an even playing field, and only recognized treaty members are allowed to participate. The race starts with mounted riders at the track’s start line and the team’s “Catcher” holding the horse. The other team members (Back Holder, Setter/ Exchange Holder) and horses are in designated boxes outlined in chalk to the side of the track. As the horn blows, the riders take off racing around the track. When they reach their team’s box, the rider dismounts and jumps unassisted onto another horse held by the “Exchange Holder.” The rider continues for another lap around the track and does another “exchange.” The third and final lap ends as riders cross the finish line. This seems straightforward, but stopping a horse that’s bred to race is no easy feat, and it fills the races with thrilling action. Relay racing involves highly skilled athletes, and the training, strength and skill needed to successfully execute an “exchange” are monumental. These exchanges are what often wins or loses the race. There are significant dangers, and team members must look out for each other. Penalties are given for infractions such as horses running loose or helping the rider mount the horse. Disqualifications are handed out for loose horses getting onto the track and other infringements. Accompanied by the keening voices of the singers and the pounding drumbeat, the flag carriers lead the dancers in their regalia for the Grand Entry, which signals the official opening. Just a few years ago in the Northern United States, Pendleton, Billings, and Sheridan hosted races, and Indian Relay Racing became wildly popular with support from the United States’ Horse Nation Relay Association. 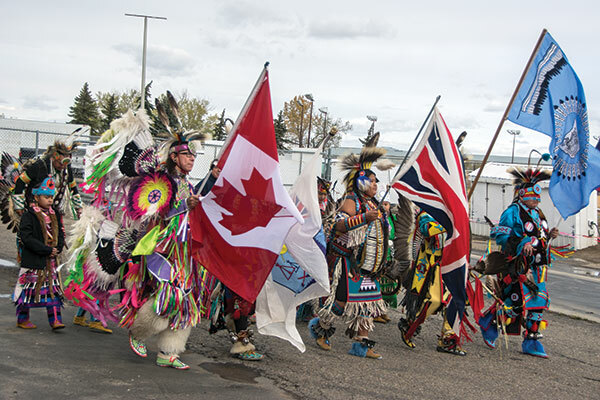 Soon the races crossed the border into Canada at Kainai First Nation in 2011. 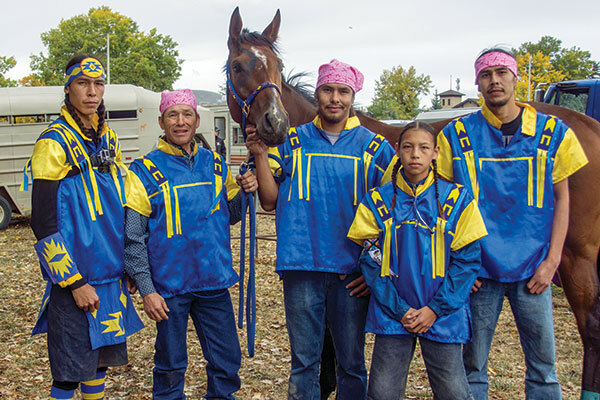 Popularity grew, and during the fall of 2017, the first-ever Canadian Indian Relay Racing Championship was held. 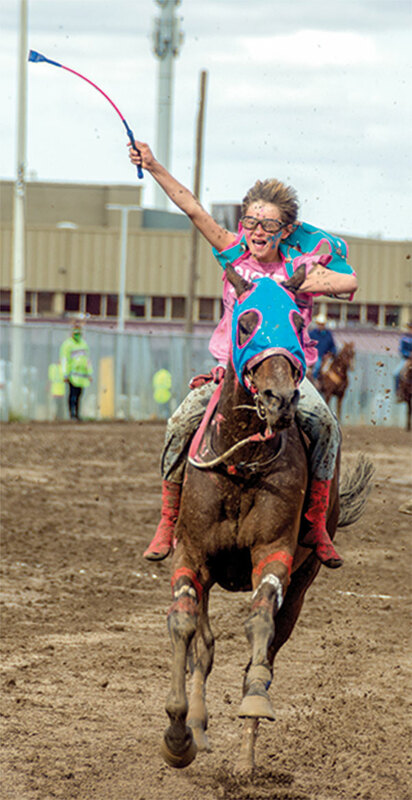 This two-day event was hosted by CIRRA and The Rocky Mountain Turf Club in Lethbridge, Alta., which included the Ladies Race, Chief Race and Warrior Race. The grandstands were full, colourful pow wow dancers stepped to the side with the last drum beat, the Grand Entry and Opening Ceremony ended and the crowd’s attention quickly turned to racing. The teams entered onto the track in their vividly coloured regalia and war painted horses, and the races began. Those attending witnessed the Mistawasis First Nation team from Saskatchewan crossing the finish line to take the Canadian Championship. Blackfoot team Old Sun, from Siksika First Nation, east of Calgary, Alta. From left, Cody Big Tobacco, Allison Red Crow, Mark Big Tobacco, Ian Big Tobacco, Skylar Bear Chief. One team attending both the Canadian Championships and the Calgary Stampede is Blackfoot team Old Sun, from Siksika First Nation, east of Calgary, Alta. Cody Big Tobacco is their Rider, Mark Big Tobacco is the Mugger/ Catcher (the one who holds the horse at the start of each race and takes the horse from the rider), Skylar Bear Chief is the Back Holder (the one who keeps the unused horse to the side) and Allison Red Crow is the Setter/Exchange Holder (the one who holds the horse for the exchange). He also owns the horses and oversees the training regimen. For more information, visit Facebook: Canadian Indian Relay Racing Association. Jun 9–10: Enoch Cree Nation; Maskwacis, Alta. Jun 29–Jul 1: Onion Lake, Sask. 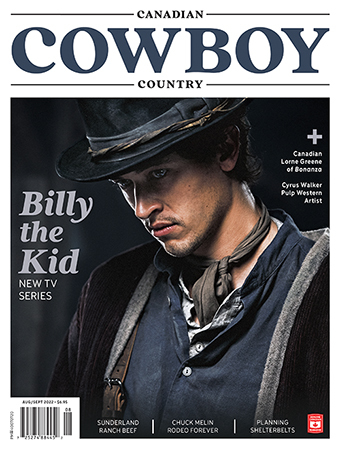 Jul 9–12: Calgary Stampede Invitational; Calgary, Alta. Jul 13–15: North Battleford, Sask. Jul 19: Maple Creek, Sask. Jul 21–22: Kainai First Nation; Standoff, Alta. Aug 4–5: Piikani First Nation; Brocket, Alta. Sep 7–9: CIRRA Canadian Championships; Lethbridge, Alta.